At GCLS, I sat on a panel called “Eat Your Heart Out,” which was about writing about food in fiction. The panel included Karin Kallmaker, Georgia Beers, and Mary Griggs, and was moderated by Lynn Ames. Lynn asked for suggestions on how ot make the panel interesting and fun for the audience. I suggested that we make it a truly audience participation session and have everyone write down ingredient ideas. Prior to the session, I asked the concierge at the front desk of the hotel to acquire 3 bowls and some paper for me. This was an ordeal in and of itself. Bless their hearts, they were trying to be helpful and accommodating and I give them props for that. But all I wanted was 3 bowls and paper and it was like a game of Pictionary trying to explain what I wanted. It went from scratch paper to white-boards. I finally had to just ask for paper out of their printer. As for the bowls, what they brought me were big enough to do some apple bobbing. Mary Griggs got lamb, eggplant, and peanut butter. Karin Kallmaker got herring, asparagus, and something from the “other” category that I don’t recall. She has my sympathy. I picked tempeh, kale, and gummie bears. And, per the rules of the game, I used all my ingredients. 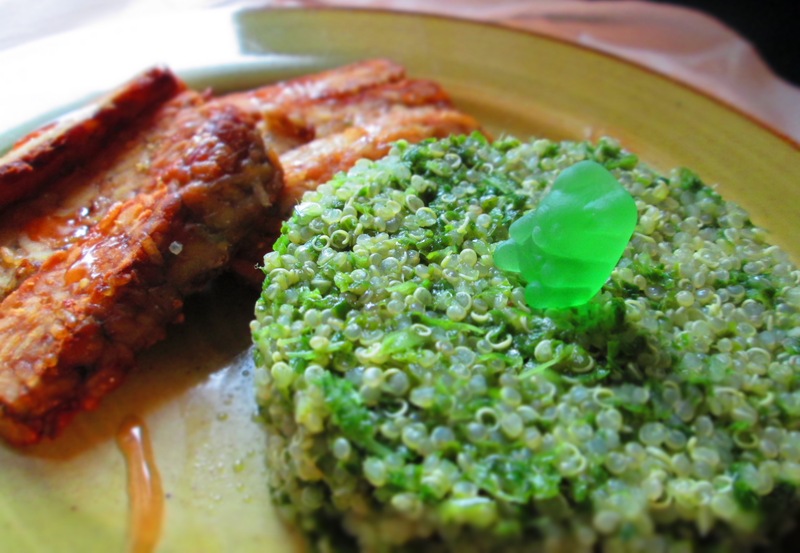 I came up with Marinated Tempeh, Quinoa with Kale Pesto, and Gummie Bear Gastrique. A gastrique is a sauce that’s made from sugar and vinegar and is then usually flavored with other ingredients. Gummie bear gastrique is intense, so go easy on it. And I would stick to red, orange, yellow, and white (no green or blue, or you’ll get a funny color). 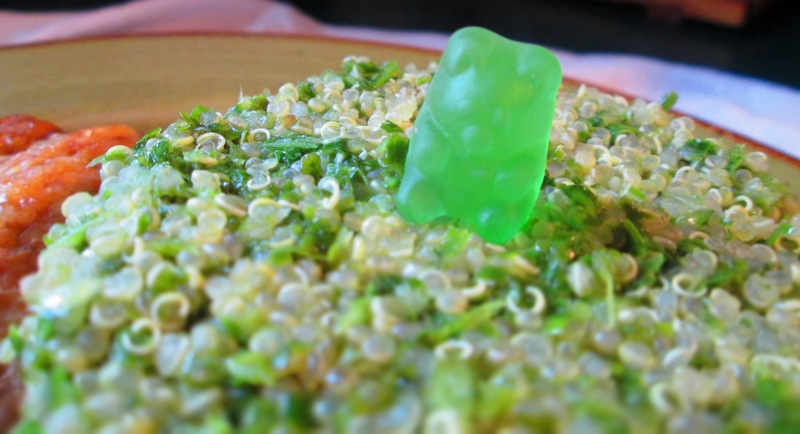 And, yes, that’s a little gummie bear sitting on top of the quinoa. 1. Place tempeh and garlic in a shallow dish. Mix 2 tablespoons olive oil and soy sauce and pour it over the tempeh; cover and let marinate for ½ hour to 2 hours. Remove tempeh from marinade. Cut into diagonal slices and let sit in marinade another 15 minutes, turning them over a couple of times. Meanwhile, make quinoa, pesto, and gastrique. 2. Quinoa: Bring 1 cup water to a boil in a small pot; add quinoa and simmer over low heat until cooked (should be translucent and tender). If it’s cooked before water is absorbed, drain in a mesh strainer. Place in a bowl. 3. Make pesto: Place kale, garlic, and salt in a food processor or blender. Start processing; slowly pour in olive oil through the feed tube. Process until fairly smooth. Taste for seasoning. Add to quinoa and mix well. 4. Gastrique: Place gummie bears in a small pot (preferably nonstick). Cook over medium-low heat, stirring occasionally, until melted. Add vinegar and continue cooking until thick, about 15 minutes. 5. Heat remaining 2 tablespoons oil (from tempeh ingredients) in a skillet; add tempeh slices and cook over medium heat, turning over once, until browned on both sides. Transfer to a plate with paper towels. 7. Place quinoa on 2 plates (you can use a cookie ring, like I did, or not). Place half the tempeh on one plate, the other half on the other plate. 8. Drizzle the gastrique over the tempeh. Go easy on the gastrique—a little goes a long way. 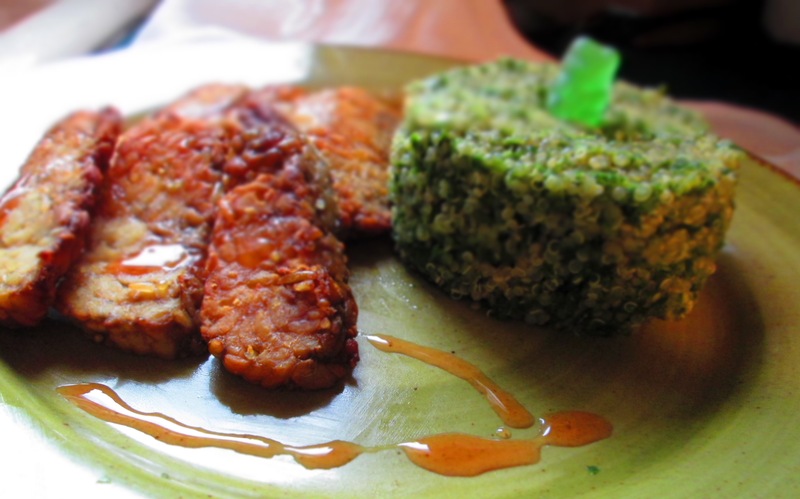 Here is RG Emanuelle’s excellent use of tempeh, kale, and gummie bears! I’ve been waiting to find out what you did with those gummie bears. I’m more than a little impressed. I love a food challenge! Not rigged. Not rigged! I swear. Making mine this weekend. Yours looks yummy! Thanks, Georgia. Frankly, I think I’d rather come over and eat whatever pasta dish you make. The gastrique idea was brilliant–I couldn’t imagine what you’d do at the panel.